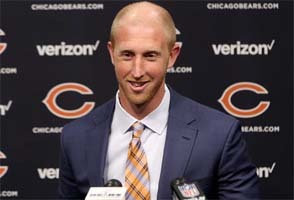 Jay Cutler is out, and former Buccaneer Mike Glennon is in. The Chicago Bears have wasted no time in making major roster shake-ups in the 2017 off season. In a long-overdue move, Chicago finally released quarterback Jay Cutler. He was still under contract, so the Bears will suffer a salary cap hit, but it shouldn't hurt their ability to sign players at needed positions. be teammates in San Fran. Did the Bears hand a playoff berth to the Packers? The Chicago Bears' season has been over for a while now, but they had an opportunity today to play spoilers for the Green Bay Packers' playoff hopes. That didn't really happen, as the Bears settled for a game-tying field goal instead of attempting to convert a fourth and goal from the four yard line to win the game. The Bears had a first and goal at the three yard line with less than two minutes in the game and down by three (27-24). A penalty backed them up to the thirteen, and they weren't able to punch it into the end zone. Micah Hyde swatted a pass out of the hands of Cameron Meredith on third down, and John Fox decided to kick a tying field goal rather than going for the win. Jordan Howard had rushed for over 90 yards, a touchdown, and a 5.3 yards per carry average over the course of the game, yet John Fox decided to throw the ball on third down and concede to the field goal. I would have put the ball in Jordan Howard's hands and given him both third and fourth downs to try to punch the ball four yards into the end zone. No way I would have settled for three. 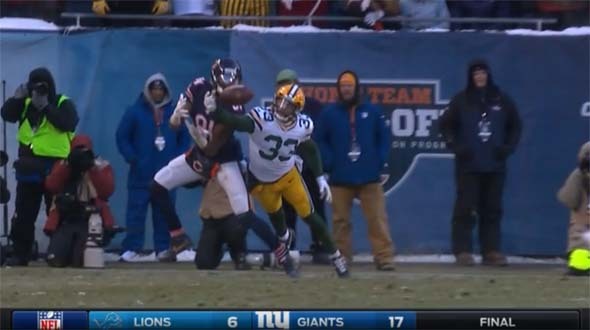 Micah Hyde swatted a 3rd down pass that would have given the Bears a late lead. Chicago had nothing to play for except beating Green Bay. Kicking a tying field goal had no strategic advantage. You have nothing to play for; there's no reason to play it safe. Let your bell-cow running back show what he can do. Oh right, NOW the Bears start winning...? I haven't had much reason to talk about the Chicago Bears this year. Since the preseason, the team has gone from bad to worse. Injuries has been the story of the season, but injuries are no excuse for the abysmally poor play from this team. The Bears have used all three of their quarterbacks and at least four of their running backs this season, as they've been going through a revolving door of injuries. Rookie Jordan Howard has been the bright spot of the season. With injuries to Jeremy Langford and KaDeem Carey, Howard has been the bell-cow rusher for most of the season. And he has performed well. Not as well as the Cowboys' Ezekiel Elliot, but still pretty good. 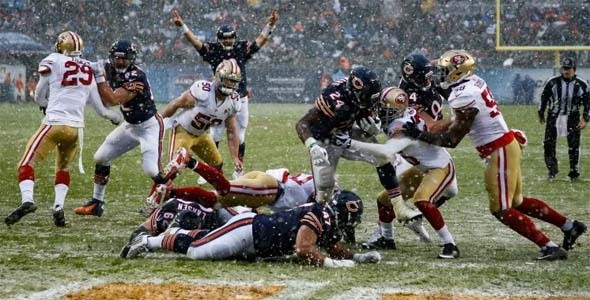 Howard carried the Bears to 3 touchdowns in a 26-6 victory over the 49ers earlier today. It looks like the Bears have found a replacement for Matt Forte, assuming that Howard can continue to perform this well in the years to come. The Bears look like they've found a replacement for Matt Forte. Jordan Howard has been excellent. The quarterback situation, however, hasn't been as fortuitous. Cutler was out for a while, and Brian Hoyer played well in his stead. 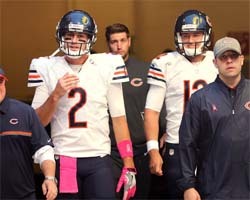 It looked like Cutler's career as a starting quarterback for the Bears was over (finally). Then Hoyer got hurt, and the untested Matt Barkley finished the game without much fanfare. The Bears weren't confident in playing a third-string quarterback, so Cutler came back the following week and lead the team to its second win of the season (a 20-10 victory over the collapsing Vikings in week 8). 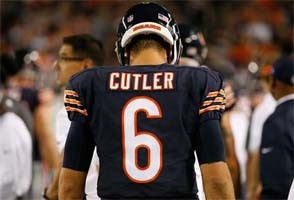 So maybe Cutler was back to form? Maybe he was going to save his job with a late-season rally? Not so. The Bears were embarrassed the following week by Tampa Bay, and Cutler got hurt once again the following week against the New York Giants. Cutler will have to have surgery to repair the damage, which means that his season (and possibly his career with the Bears) is over.